Insertion: lateral femoral epicondyle distally (11 mm) and either anterior or posterior (mean 0.84 mm anterior) to the lateral collateral ligament. (Brinkman JM, JBJS 2005;87Br:1364). Function: Primary function is to externally rotate the femur allowing flexion when the knee is loaded. Also: resists excessive external rotation of the tibia during knee flexion from 20 to 130 degrees; resists excessive varus rotation of the tibia during flexion from 0-90 degrees (Nielsen S, Arch Orthop Trauma Surg 1986;104:357-62); restricts posterior tibial translation; functions as a dynamic internal rotator of the tibia. lies anterior to the popliteal vein and 9mm posterior to the posterior aspect of the tibial plateau when the knee is in 90° of flexion. Consists or long head and short head. Insertion: Primarily fibular head, but also sends attachements to the ITB, Gerdy's tubercle, LCL and posterolateral capsule. Function: flexes knee and hip, dynamic external rotator of the tibia and lateral knee stabilizer. Travels deep to the long head of the biceps muscle in the thigh. Splits the two heads of the gastrocnemius and travels deep to the soleus in the leg. Travels laterally in popliteal fossa between the medial border of the biceps and the lateral head of the gastroc. Winds around the neck of the fibula, deep to the peroneous longus. Terminates as the superficial and deep peroneal nerves. Travels between lateral and anterior compartments of the leg. May become entraped against its fascial opening in the distal leg. (Styf J, JBJS 1989;71B:131). Innervates: Peroneus longus, Peroneus brevis. Travels along the anterior surface of the interosseous membrane. Terminates as a cutaneous nerve supplying sensation to the first web space. Origin: L3,L4, the terminal branch of the femoral nerve. Supples sensation to the medial knee, lower leg and ankle. Runs out the adductor canal, down the posteromedial knee, emerging between the sartorious and gracilis tendons. Lies immediately superficial to the gracilis at the posteromedial joint line. Infrapatellar branch of saphenous nerve is commonly injured during medial arthrotomies resulting in medial knee numbness. Saphenous neuropathy: neuropathic pain or numbness in the medial knee, calf and ankle. No motor or reflex abnormalities Diagnosis can be confirmed with anesthetic blockade causing pain relief, or EMG. Can be treated with steriod injection, neurolysis or neurectomy (Worth Rm, AJSM 1984;12:80). Lies posterior to the sartorious. It is anterior to the semitendinosis with the knee in extension. Exits the adductor canal on its way to the anteromedial aspect of the knee. Origin: supracondylar tubercle of the femur. Insertion: Gerdy's tubercle of tibia, patella, patellar ligament, supracondylar tubercle. Function: important stabilizer of the lateral knee. Function: Primary restraint to anterior tibial translation (90%); Secondary restraint to tibial rotation; Minor secondary restraint to varus-valgus angulation at full extension. Innervation: Posterior articular nerve (a branch of the tibial nerve) (Kennedy JC, JBJS 1974;56A:223). Normal ACL has proprioceptive senses that help protect the knee joint during use which are lost after reconstruction. Tensile strength = 2,150 N, stiffness = 242 N/mm. Tension forces in the ACL are highest with the knee in full extension (Markolf KL, JBJS 1996;78A:1728). 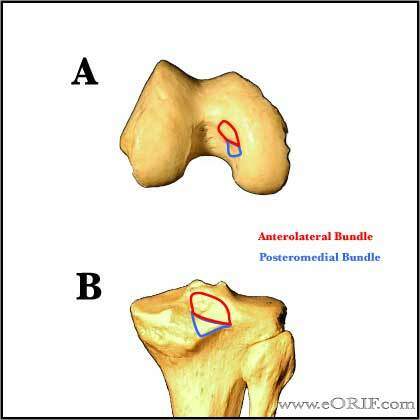 Origin: Broad crescent-shaped area on the anterolateral aspect of the medial femoral condyle. (Girgis FG, CORR 1975:216-231). Insertion: Posterior tibia, below the articular surface. (Girgis FG, CORR 1975:216-231). Function: PCL is responsible for 95% of total restraint to posterior translation of the tibia. Secondary restraint to tibial external rotation. In the PCL deficient knee posterior tibial translation is greatest at high flexion angles and is increased with sectioning of the posterolateral corner, MCL and posteromedial structures. (Noyes FR, AJSM 1993;21:407). Innervation: Posterior articular nerve (a branch of the tibial nerve) (Kennedy JC, JBJS 1974;56A:223). Normal PCL has proprioceptive senses that help protect the knee joint during use which are lost after reconstruction. Origin: posterior (4.6 mm) and proximal (1.3 mm) to the lateral femoral epicondyle posterior and superior to the insertion of the poplitieus. (Brinkman JM, JBJS 2005;87Br:1364). Insertion: posterior (8.1 mm) to the anterior point of the head of the fibula. (Brinkman JM, JBJS 2005;87Br:1364). Function: Primary restraint to varus stress of the knee. Resists tibial external rotation. Section the LCL increases external rotation at 30°. External rotation of the tibia is highest after sectioning the LCL and PCL with the knee at 90° flexion. (Gollehon DL, JBJS 1987;69A:233). Tight in extension, lax in flexion. Composed of superficial and deep fibers. (Satterwhite Y, Op Tech Sports Med 1996;4:134) (Warren RF, JBJS 1979;61A:56). Insertion: Superficial MCL=periorsteum of proximal tibia, deep to the pes anserinus. Function: Primary restraint to valgus instability. Deep MCL is a capsular thickening. More commonly injury at is femoral origin than tibial insertion. Origin: distal (1.3 mm) and anterior (0.5 mm) to the tip of the styloid process of the fibula. (Brinkman JM, JBJS 2005;87Br:1364). Insertion: joins popliteus tendon to insert into the lateral femoral epicondyle. Function: reinforces posterlateral capsule, covers the popliteus. 70 % of knees have either anterior meniscofemoral ligament of Humphrey or posterior meniscofemoral ligament of Wrisberg. Origin: posterior horn of lateral meniscus. Origin: Adductor tubercle of the distal femur: medial epicondyle immediately superior to the attachment of the medial collateral ligament. (Steensen RN, AJSM 2004;32:1509). Insertion: superomedial border of the patella via a wide insertion: @1 cm distal to the superior pole of the patella, near the widest portion of the patella. (Steensen RN, AJSM 2004;32:1509). Courses deep to the retinaculum in layer II; deep to the sartorius and is partially cavered by the Vastus medialis. Function: Provides 50%-60% of the resistance to lateral displacement of the patella. Mean length = Mean width+ (Amis A, Knee 2003;10:215). Strength = 208 N (Moutney J, JBJS 2005;87Br:36). >94% of Patellar Dislocation are related to MPFL rupture. Medial meniscus transmits 50% of the load in the medial compartment. Lateral meniscus transmits 70% of the load in the lateral compartment. (Greis PE, JAAOS 2002;10:168). Degenerative changes occur earlier in pts undergoing parital lateral meniscectomy than partial medial meniscectomy.